Heading Providing the most trusted feminine protection anywhere. Directions The absorbencies of all tampon brands have been standardized. 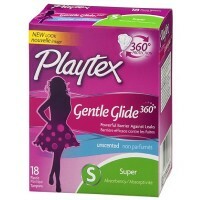 Use this chart to compare Playtex absorbencies to other brands. Select the minimum absorbency needed to control your menstrual flow in order to reduce the risk of getting TSS. Regular: 6-9 g. Super: 9-12 g. Super Plus: 12-15 g.
Uses Our new unique double layer, cross-pad design protects against leaks. New absorbent core locks away fluid. New 360 degree protection design opens all around, conforming to your body. 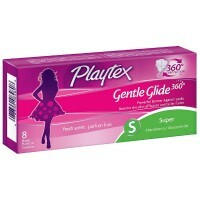 Now, our smoothest applicator ever for amazing comfort. Warnings ATTENTION: Tampons are associated with Toxic Shock Syndrome (TSS). TSS is a rare but serious disease that may cause death. Read and save the enclosed information.